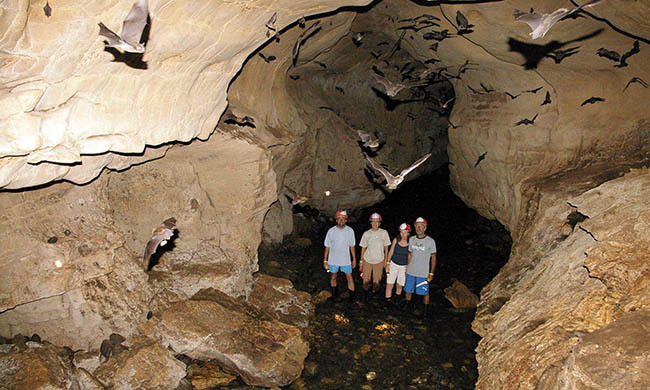 Journey into the Depths of the Earth on this Spelunking Tour. See another side of Costa Rica when you delve into the Venado Caverns for a spelunking tour near Costa Rica’s Arenal Volcano. In your two hours, you’ll be led by an experienced guide through limestone caves believed to be between 15 and 20 million years old. This is an exhilarating underground passage in the middle of the pristine tropical forest. Not a spelunker? Not a problem! Your tour guide will show you everything you need to know. You’ll be crawling, climbing, and wading through small passages partially filled with water, so get ready to get wet and dirty. Age limit: Minimum nine years old. Your tour includes: transportation, bilingual guide, helmet, flashlight, cave entrance fee. What to bring: camera, change of clothes and shoes (essential). Wear comfortable clothes to get wet and shoes with a good grip. Not recommended for: Those suffering from claustrophobia or bad knees.